PK King series poker analyzer is a famous brand of barcode marked cards analyzer for its high scanning speed and analyzing accuracy. Now, we have PK magic lighter scanning camera on sale. This PK magic Texas poker cards lighter is a multi-frequency signal transmission scanner. The good point of multi-frequency signal transmission is that you can change the frequency with poker analyzer so that other players could not receive the game results as well; What is more, multi-frequency poker scanner can work with different best hand poker analyzer. 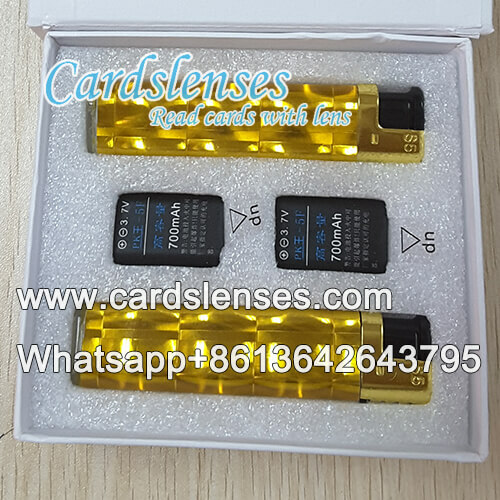 Following are the details of this PK magic playing cards scanner lighter: scanning distance is from 20 to 30 cm; working distance with poker analyzer is about 5 meters; its battery life is about 1 hours, and you can replace it with other full charge battery.